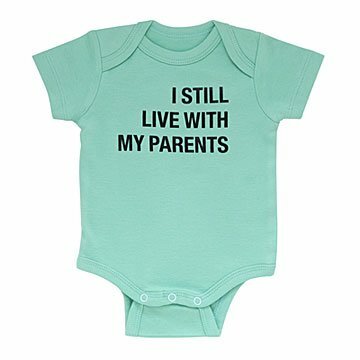 Ain't no shame in baby's game...this funny babysuit tells it like it is. Sponging off his or her mother and father, with a rent-free party lifestyle...what's in this baby's future? That's easy: he or she will be photographed and shared on social media like a star. An itty, bitty, mini star with a mega credit line at the Bank of Mom and Dad. Made in China. Would Love more size options! Pretty hard to decide if the baby is a casual or trendy kinda kid, I would say this little onesie is best for casual wear.